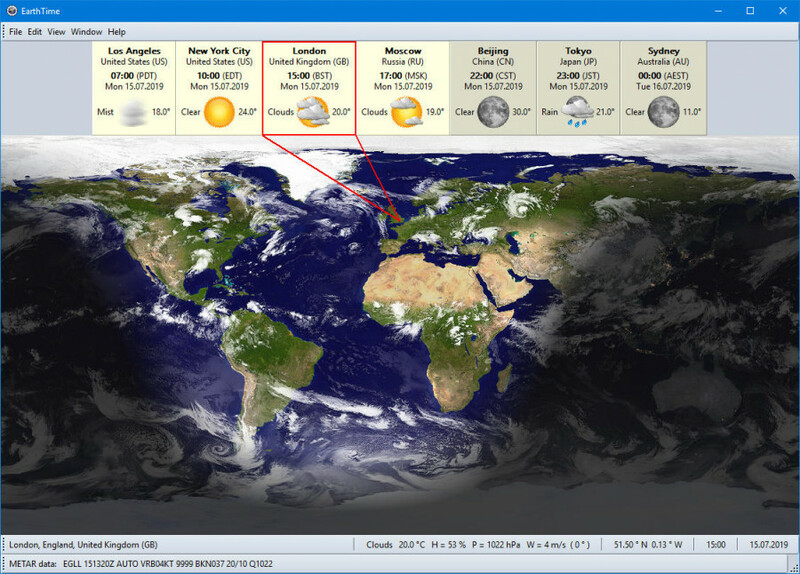 EarthTime 1.8.0 is pims & calendars software developed by DeskSoft. This business software is shareware, which means you can download and use EarthTime 1.8.0 for free during the trial period (usually for 30 days). At the expiration of the period you will have to buy the pims & calendars product for $10.00. EarthTime 1.8.0 is available at regnow and DeskSoft website. EarthTime 1.8.0 supports English interface languages and works with Windows 98/XP/Vista. We have tested EarthTime 1.8.0 for spyware and adware modules. The software is absolutely safe to install. Our website has thoroughly tested business product EarthTime 1.8.0, written the review and uploaded installation file (553K) to our fast server. Downloading EarthTime 1.8.0 will take several seconds if you use fast ADSL connection. More than a clock! Displays the current level of natural light (daylight, twilight, or night), moon phase information, local times and country flags for cities throughout the world. MaBaSoft World Clock CSM is a multi-time clock. VelaTerra is an interactive almanac and world clock that displays the current level of natural light (bright daylight, three levels of twilight, and night), moon phase information, local times and country flags for major cities throughout the world. @-time is a simple application that displays local time and the time in four world cities. Time Palette enables you to accurately determine the local time in a distant city.